Robert Byrd, the longest serving senator in history, criticized President Obama's appointment of numerous White House advisors, also called "czars," saying the presence of the czars gives the president too much power. These czars report directly to Mr. Obama and have the power to shape national policy on their subject area. So far, Mr. Obama has recruited czars on health reform, urban affairs policy, and energy and climate change. Unlike Cabinet secretaries, they do not have to be approved by Congress. In a letter to Obama on Wednesday, Byrd, a Democrat, said that the czar system "can threaten the Constitutional system of checks and balances," Politico reported. 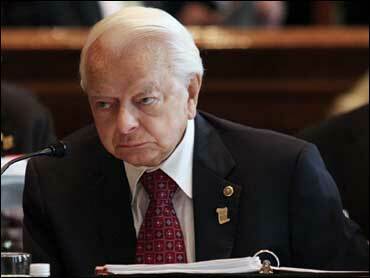 Byrd added that oversight of federal agencies is the responsibility of officials approved by the Senate. "As presidential assistants and advisers, these White House staffers are not accountable for their actions to the Congress, to cabinet officials, or to virtually anyone but the president," Byrd wrote. "They rarely testify before congressional committees, and often shield the information and decision-making process behind the assertion of executive privilege. In too many instances, White House staff have been allowed to inhibit openness and transparency, and reduce accountability." Byrd has been a longtime critic of policies that concentrate power in the executive branch. He often fought with the Bush Administration and Wednesday's letter shows that he doesn't mind going after a president from his own party. These days, however, Byrd's comments have less force as he is no longer the chairman of the powerful Senate Appropriations Committee.